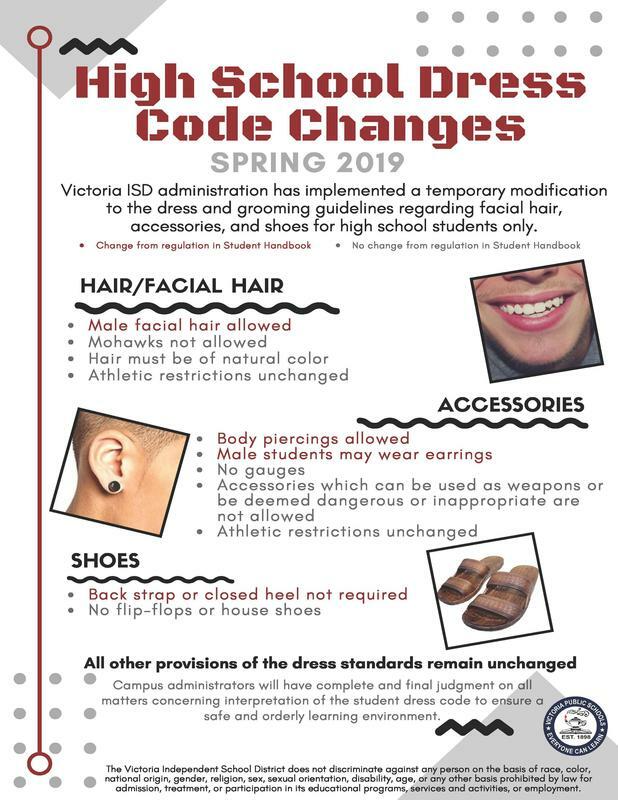 Victoria ISD has temporarily eliminated three provisions of the students dress code for high school students during the spring 2019 semester. As part of his Listening & Learning tour, Victoria ISD Superintendent, Dr. Quintin Shepherd, conducted an online exchange of thoughts and ideas with high school students. One topic discussed in the exchange was attendance. And, a thought shared by many of the students was to revisit some of the district's dress code provisions. High school administrators have been meeting and discussing how the district can be accommodating and responsive regarding some of those provisions, allowing students to embrace responsibility in all areas, including responsibility for dress, and their daily attendance. *Are students able to demonstrate personal responsibility as it relates to appropriate school dress in a public school building? * Did we meet our attendance goals? Students will still be required to comport with athletic requirements regarding hair length and maintenance. Students will be required to comport with athletic requirements regarding jewelry. Regarding the above three items, campus administration and staff are expected to maintain a safe and orderly learning environment. Should there be a clear or substantial disruption to the learning environment, staff will take any and all necessary and appropriate action to restore order.